A story that was published just last Sunday about a Birkin scammer has been the talk of many netizens and people who are just about curious and furious to know the identity of the said scammer. She was a simple girl turned socialite in over a few years so it was definitely something that most mere ordinary people like me are intrigued about. Well I won’t talk about her here but instead I shall share with you all my two cents on designer bags. I admit I am slowly loving designer bags. It was actually my sister who introduced me to the idea of owning and investing on these luxury items. It wasn’t a welcoming idea back when I was still in college since I was paying for my tuition and other daily expenses so owning designer or anything beyond a few thousand pesos worth of material things didn’t exactly cross my mind. Until after I graduated did I open up to the idea. The thing that triggered me to get convinced on having a decent designer bag more than the name of the brand is the quality it gives. Truly my sister was right. I have a lot of good bags ranging from brandless to the usual brands that I love and can afford. But then with only a few months or a year of use they eventually gave up on me. Loose stitching, holes, rips and tears from my daily usage were always the problem no matter how nice nor good the material of the bags were and these reasons always prompted me to buy new ones. The idea of value for money was presented to me by my sister: Would you go for a 2,000 pesos bag that you will only get to use for a few months to a year or a 20,000 pesos bag that you can use everyday and even pass down to your daughter? Of course my immediate reaction was that I’d go for the P2,000 bag! Because P20,000 for a bag is just too much! Again the idea of value for money was raised. A P2,000 bag that you can use for say a year is equivalent to P166 pesos a month while a P20,000 bag that you can use for say 5 years is equivalent to P333 a month and can even last longer than five years. 10 years and it’ll seem like you pay about P166 pesos a month of usage, just the same as buying a P2,000 bag that will eventually give up on you in a year or two. I was convinced. So I started with my very first “designer” bag which was a Ralph Lauren. That was designer enough for me back then because it was more than my few hundred peso bags. It was worth it. That started it all. Until I found myself shifting from RL to the coveted LVs and Guccis which of course were mostly bought second hand from friends, from trusted sellers while some I bought during our trips abroad (way cheaper). I also set a budget when buying designer bags, I spend way less on shoes and clothes and other material things. This way, I can balance my budget and still be practical without feeling guilty. My husband’s first thought about it is that it’s crazy! That the collective money I’ve spent can be put to a more reasonable investment. Until he realized that I don’t hoard on bags and instead buy only once a year, knowing that it’ll last more than a few years or so. Although I have to admit I am quite careless when it comes to my bags. I still treat them as material things, I am not one that would give much fuzz about them. Sometimes, it’s the husband who’s more affected whenever he sees me not taking proper care of my bags. Well I couldn’t blame him after all, its not something that I could replace like its a pair of old socks once they’re destroyed or ruined. You see more than the name and the brand and the number of bags, I consider quality as my topmost priority. I am not one of those girls who really save up (won’t spend a dime on other things, nor even eat a proper meal) so that they can buy the bags they lust (but I think I’m starting to be one). I don’t plan on collecting (although the thought is quite inviting). I just buy because I want to invest on good quality bags that I know eventually I can give to Gabbie when she’s older (imagine it as heirlooms) and can be considered as vintage items. I think more than anything, what I consider now that I have a growing family is to keep the essentials and of course value for money. I may only have a few things but I make sure these few ones are great enough to last a lifetime. May it be bags, shoes, clothes (oh thrifted ones are hard to resist!) or even our household items. It has also helped that our home isn’t big enough to entertain hoarding. My priority now is quality over quantity and need versus want. It’s hard and challenging but it’s doable. As what I always say, it doesn’t matter if you can afford something or not. The real question is, do you need it more than you want it? Is there value for your money? Is it a good investment? Bonus if what you want is something that fits your budget and your lifestyle. Balenciaga. Part time or City. Either one I’ll take it! Material things are to be used and treated as what they are, remember that they are not as valuable as your life, your loved ones, your family and friends so never, ever think that they are and never treat them that way. – If you really want something, save up. If you can’t afford it then don’t even dare buy it. -Know your priority. It’s okay to want but please consider if it’s really worth buying. – Most people think that what you have and what you own defines who you are. Are you one of those people? – If you want something just to impress others then clearly you have the wrong behavior. – I’m not generalizing, there are other things that have value for money without spending much and it really doesn’t have to be a luxury item or a designer one. Such examples are my thrift finds. – Seriously, in this day and age social status isn’t a big of a deal. -Real rich people never brag nor show off. They’ve got nothing else to prove. – True friends won’t pressure you to own or do things you know you can’t have or do. -Quality reins supreme over quantity. -Work hard in getting what you want. – It’s not the end of the world if you don’t get what you want. – You won’t be judged based on what you have but on how you treat others. Not unless the one judging you is materialistic and shallow. – Having a few good ones are far better than having tons that don’t last. That goes for material things and for people. – Remember that cash is king. Invest only on things you know you can use even when you’re old and gray. Something you can even pass down to your kids or grand kids. Because at the end of the day material things are just material things. i love this post… since i am a stay at home mom, literally, i just gush over the photos published here. hahaha! but then again not just in bags, i too try to buy things that would really last, I may not have designer clothes or whatever but there are brands out there that give quality clothes even at a price that is really expensive. it is the QUALITY of the material you are buying… tama ito… and if one day i have the money, I will buy 1 or 2 of the best designer bags there is. I have 3 girls, at least may magagamit sila. hehehe! I also WANT to have a Celine tote and an Alexa! BUT like you, there are more important things we need to spend on. I only have one small LV as my post-partum gift. Now, it’s just ridiculous to spend over 5 figures for a bag when we have tuition to pay, and house we’re still paying for. And I also believe that if you can’t buy the genuine article, then don’t buy at all. Better for me to buy a practical affordable no-name bag, than a fake signature bag. 🙂 let’s start saving and wishing! I love this post. Now I know the idea behind the designer bags. So it’s like an heirloom then? At least your explanation makes the bag really worth it. Unlike for some who treats designer bags as a social status. I love bags but I never dreamed of owning a designer bag. For one, I’m realistic, I know I cannot afford it. A designer bag for me are those bags sold for 5k max. That’s it and I am happy with that because I only buy quality bags that would last me for at least 2 years. Plus I’d rather buy gadgets or use that amount of money for travel. 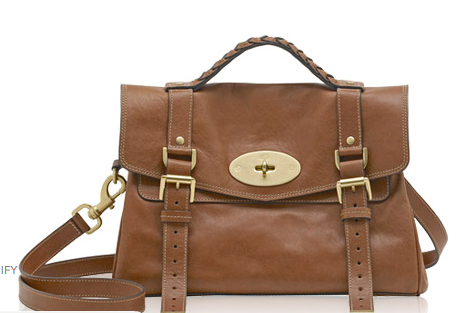 Though I still drool over designer bags, especially that Mulberry satchel, I can’t help it. I appreciate bags like I appreciate art. I just look. This caught my attention since I am a bag lover <3 I totally agree with you about bag as a heirloom. My dad was the one who introduced me to designer bags when I was in 5th grade. He bought me a DKNY bag pack and it lasted for years. He taught me about quality over quantity and since then, it was engraved to my heart when deciding to buy anything. Moving on, for some unknown reason… bags makes me feel happy whenever I buy the ones that my heart desires especially from my hard earned money and within my means. In a span of two years of saving, I am happy that I owned designer bags like LV, Balenciaga (city) and Mulberry Alexa and I am glad to be "their" mom LOL. Sounds superficial but people who are bag lovers can really relate what my heart feels and glad I have a supportive husband who helps me decide before buying by listing pros and cons haha! Maybe when I am already a mom like you, I'll think bazillion times na! Just to share, last week my husband and I were deciding if I'll buy that Celine tote since I am lusting for it since last year, as seen in my favorite fashion blogger 9to5 chic. A legit celebrity seller Sherilyn Reyes-Tan sells Celine Tote (Php 140K++) It was really a hard decision vs Chanel Classic Flap. After soliciting pieces of advice from my trusted bag lover friends, they said that If I really don't have the heart to spend that "big" again… I might as well buy the Chanel Classic Flap and fly to Hong Kong for firsthand experience shopping. I opted for Chanel 🙂 To wrap things up, share your experience once you have that Celine tote that also stole my heart in a second!